Much like the home run sluggers of the 1920s revolutionized hitting, Walter Johnson revolutionized the game of pitching with power, speed, and an emphasis on striking out batters. A member of the first-ever Baseball Hall of Fame class, Johnson held the top strikeout record for over five decades. In this list, we highlight the key Walter Johnson baseball cards from his playing days, including some of the most valuable cards ever produced. 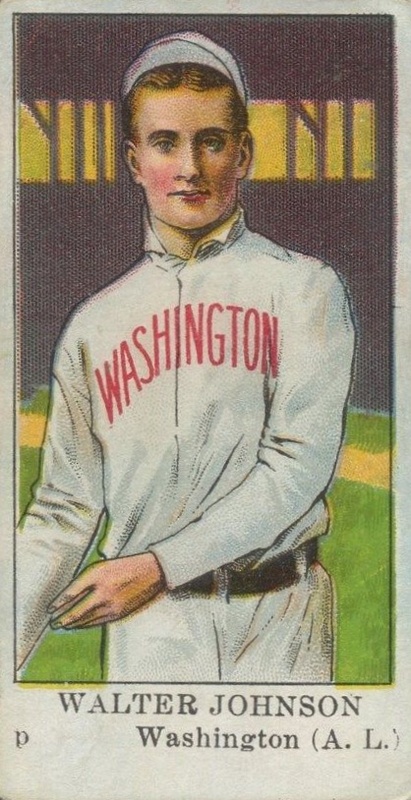 Spending his entire career with the Washington Senators, Johnson debuted on the mound in 1907. Given the nickname "The Big Train" for his imposing physicality and powerful pitching, he was as consistent as an on-time train. In 12 seasons, Johnson accumulated 20 or more victories with two incredible years featuring more than 30 wins. Shop for Professionally Graded Walter Johnson cards on eBay. His first 30-win season would be in 1913 when Johnson went 36-7 and had an amazing .837 winning percentage. He would lead the American League in ERA and shutouts, earning him the MVP Award. 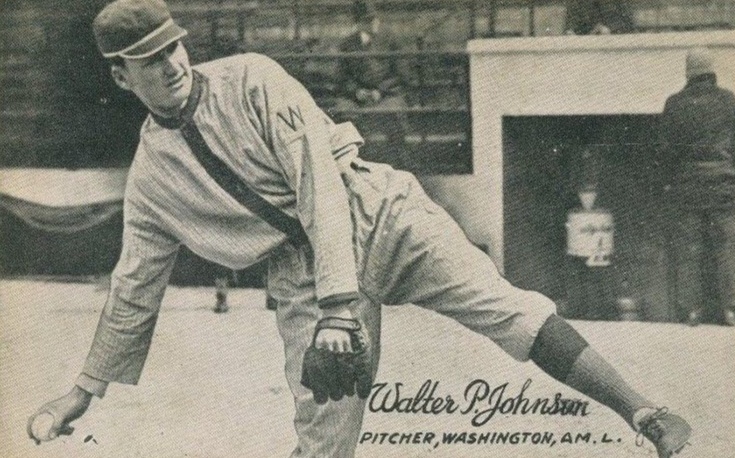 Johnson also captured pitching's Triple Crown by topping the league in wins, strikeouts, and ERA three times (in 1913, 1918, and 1924) and added a second MVP during the 1924 season. 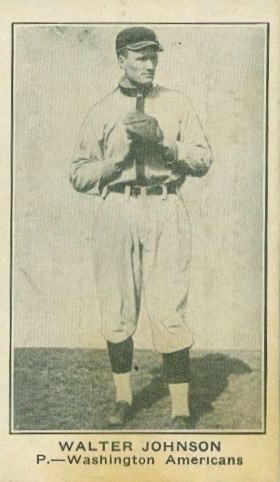 In addition to his impressive individual stats, Johnson enjoyed team success and he captained the Senators to back-to-back World Series appearances in 1924 and 1925, coming away with the title in 1924 versus the New York Giants. Although Johnson lost two games in the series, he operated out of the bullpen as an extra-innings reliever in Game 7, helping his team close out the win. 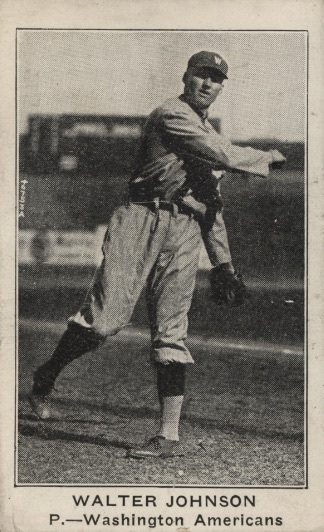 At his retirement, Walter Johnson was second in all-time wins with 417 and is still the career leader in shutouts with 110, a record which will probably never be broken. His strikeout record of 3,508 set the mark for 56 years until it was broken by Nolan Ryan in 1983. In 1936, he became one of two pitchers selected in the inaugural group for the Baseball Hall of Fame. For most collectors, owning an original Walter Johnson vintage card would be nearly impossible. Their scarcity and the demand high-end collectors have for them places their prices out of reach for many in the hobby. However, Johnson has several cards from the 1950s, 1960s and 1970s that would work for collectors on any budget. The Baseball Hall of Fame issued a set from 1950 to 1956 that featured the early members to the Hall and Johnson's card has a nice ink drawing of him. "The Big Train" was also featured in the budget-friendly 1960 Fleer and 1961 Fleer Baseball Greats sets. Two additional appearances include 1961 Golden Press Hall of Fame, which came in book form with the cards on perforated sheets, and 1963 Topps Bazooka All-Time Greats as inserts in Bazooka gum boxes rather than its own individual product. In the 1960s and 1970s, Topps frequently included cards in their sets devoted to the legends of the game. Johnson has many cards from this period that are light on the wallet. The first of these tribute cards came in 1961 Topps and it honors Johnson's amazing feat of throwing three shutouts during a four-day stretch in 1908. Topps produced cards for the career statistical champions in 1973 Topps and Johnson is featured as the strikeout and shutout leader. In 1976 Topps, an All-Time All-Stars list named Johnson the best right-hand pitcher ever. Lastly, in 1979 Topps, he was featured with the man who would eventually break his strikeout record, Nolan Ryan. Since many of the best Walter Johnson cards are quite expensive, graphic design along with collector demand was also considered in determining the placement of each card on the list. Click on the card titles or images to shop for specific cards on eBay. When available, linked sets in the descriptions go directly to detailed product profiles. 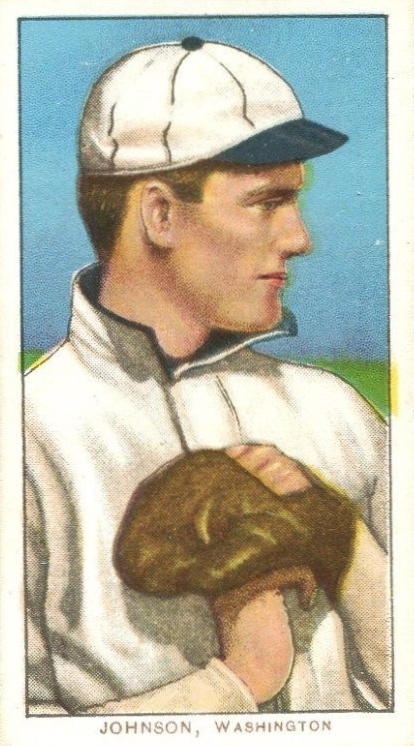 While several of the cards in 1908-1910 American Caramel use the same illustration for different players, Johnson seems to have his own portrait in the set, albeit with a more youthful look than he may have ever truly had. The set was issued in three yearly series with slight variations in the checklist from year-to-year along with some modifications on the reverse side to differentiate the sets. 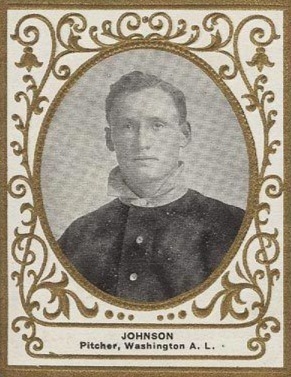 Johnson can only be found among the cards issued in 1910 just as he was becoming a star pitcher, going 25-17 that season. The Willard Chocolate Company was based out of Canada and issued three trading card releases in the 1920s. The V100 set features sepia photographs on cards that are just slightly smaller than the dimensions of modern trading cards. 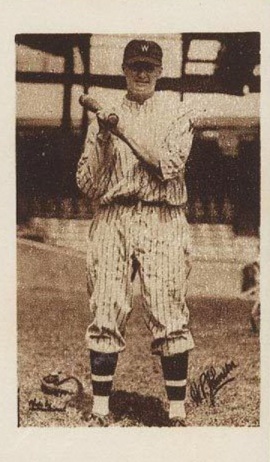 Johnson's card stands out from the others on the list as he is holding a baseball bat in his photograph. Overall, Johnson was pretty good at the plate, sporting a career batting average of .235 on more than 2,300 at-bats. The king of non-tobacco cards during the early 20th century has to be American Caramel Company, which created many iconic sets through the years. The set known as E121 was first issued in 1921 and features two different Johnson photographs, one with his hands near his chest and the second one of him throwing. You can find that second image reused in several sets including card #4 on this list. Mecca Brand Cigarettes issued this ground-breaking idea for a trading card in 1911. A single player would be featured on one side of the very tall card while the reverse would have the top half of another player. Johnson is shown on the front and joined by his Senators' teammate Charles Street on the back. The idea here was that the top could be folded over to create another card in a two-in-one format. This set would be the inspiration many years later in 1955 Topps Double Headers. My personal favorite card of "The Big Train" is this rarely seen, horizontally-framed card produced by the Exhibit Supply Company in 1921. The Exhibits series of cards debuted with this postcard-sized set and they would continue to be popular for decades to come. The brand was sold in small vending machines in candy stores and diners and the initial set features black-and-white photos of 64 players. 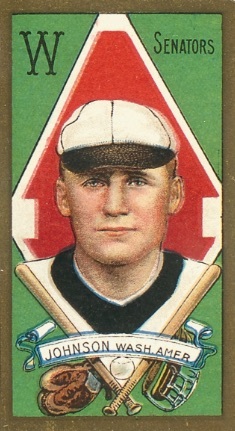 The unique gold borders are the trademark of the T205 set and Johnson, playing for the American League's Washington Senators, is featured using the AL design of his portrait in the middle of a baseball diamond. National League players feature a more basic portrait design but also incorporate the first ever use of facsimile autographs. The most common cigarette brand backs for the set are Piedmont and Sweet Caporal. The intricate border of 1922 E120 American Caramel has made it a very popular set for collectors. 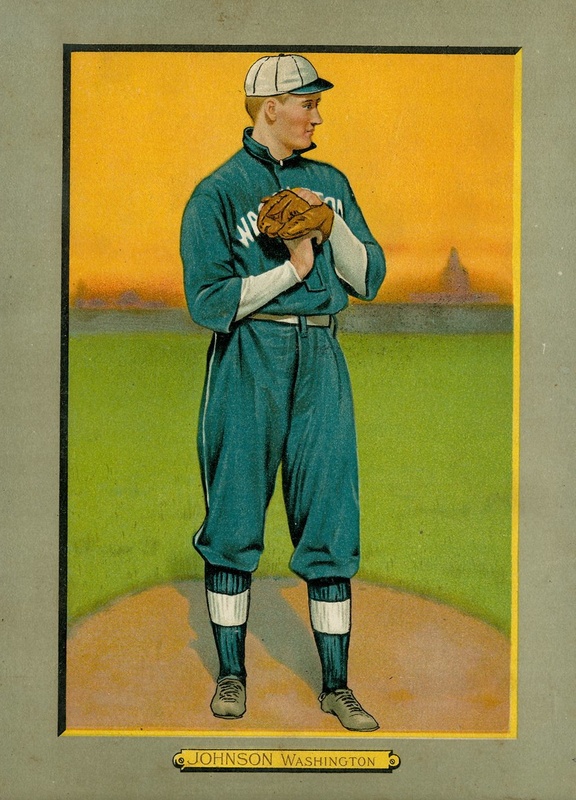 National League players were printed on blueish-green cardboard and American League players (including Johnson) were printed on cream-colored stock. 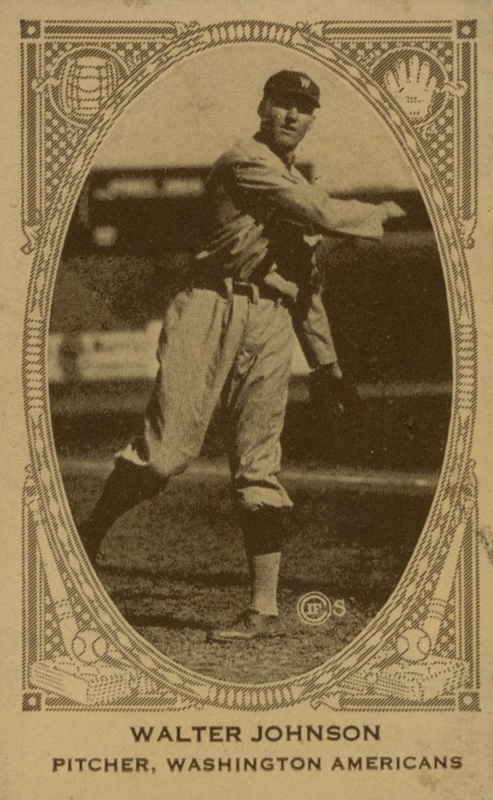 Johnson's photograph is one that has been featured on many different cards with this particular appearance being the most valuable. The reverse side of Johnson's card features a listing of the other Senators players found on the set's 240-card checklist. Johnson's 1910-1911 Turkey Red oversized cabinet card is one of his most striking collectibles with its detailed original artwork and beautiful coloring. These cards could be purchased through a mail-in offer of coupons from packs of Turkey Red cigarettes (as well as a few other brands). Along with baseball players, there are also boxers included on the checklist. Johnson's card is only topped by Ty Cobb for the set's most valuable card. The 1909 T204 Ramly set features some of the most beautifully designed cards ever made. The design makes you feel like you are looking into a gilded picture frame with the player's photograph in the center. Card backs come in two varieties that either say Ramly Cigarettes or T.T.T. Cigarettes. As one of Johnson's first trading cards, this has come to command top prices at auction and is the most valuable card in the entire 121-card set. As you might have guessed, Johnson's two appearances in the most popular set of the tobacco card era, the T206 set, are the co-champions of this list. 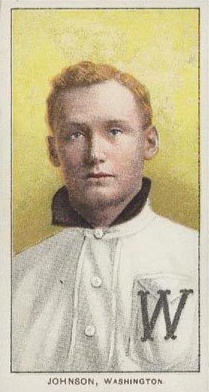 At the time of the set's creation, Johnson was not yet a star, posting no winning records in his first three professional seasons. Based on value, Johnson's T204 card can sometimes come out a but higher, but the T206 set blows it away in popularity with collectors. Johnson's yellow portrait card, which is slightly more popular than the glove card, can top $6,000 at auction for near-mint graded copies. 1927 W560 Walter Johnson Senators "Numeric grades are TOUGH!! HOF PSA 4 ! !